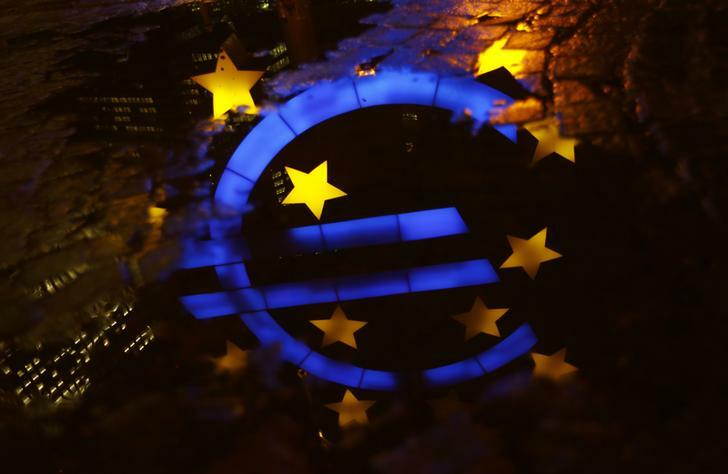 The ECB’s quantitative easing rules reflect the incomplete unity of the single currency. They’re forcing the German central bank to buy more of its government’s bonds than the market can easily provide. In May, the mix of maturities purchased probably added unwanted volatility. The famous euro sign landmark is reflected in a puddle outside the former headquarters of the European Central Bank (ECB) in Frankfurt, late evening January 8, 2015. The average maturity of German bonds bought by the Bundesbank and European Central Bank fell to 7.11 years in May, compared with 7.9 years the month before. The average maturity of German debt purchased in May was 5.67 years, versus 7.68 years in April, according to Jefferies estimates.